Compulsory military service, known as conscription, was introduced in Britain in 1916. Initially, it only applied to men between 18 and 41 who were unmarried. Married men were called up soon after, and later in the war the upper age limit was increased to 50. Opinion pieces, letters and even poems ran in local Doncaster newspapers early in 1916, urging men to enlist so conscription could be avoided. 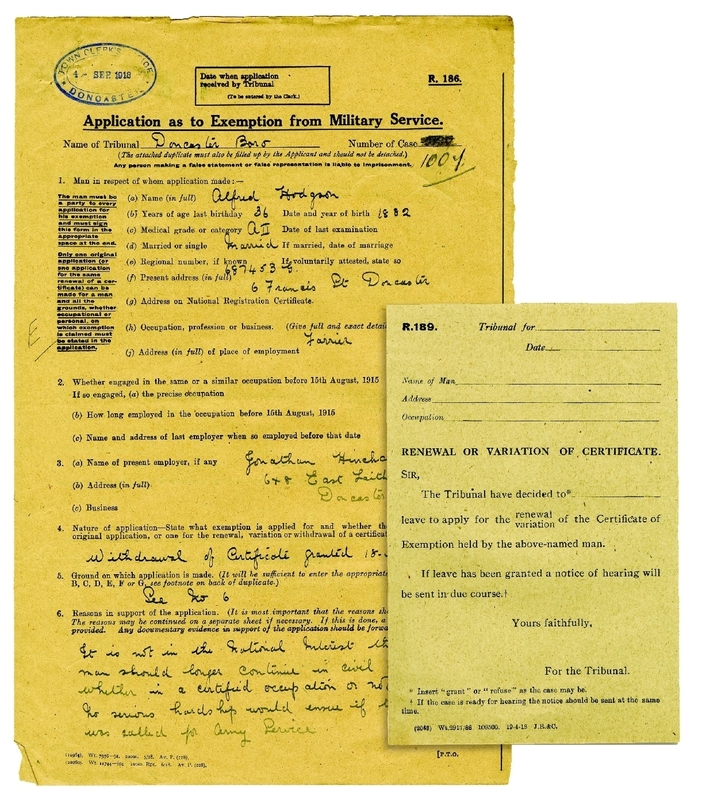 Not everyone was happy about the introduction of conscription, and many used the conscription tribunal system to seek exemption from service. Throughout 1916 and beyond, the ‘tales told to the tribunals’ were the talk of the town and the local press. In Doncaster, as with many other places, the reasons for applying for exemption were varied. Some were on moral and religious grounds and these were known as conscientious objectors. Others were on grounds of disability, family situations and economic business cases. Sittings of the Tribunal were held at the Mansion House and presided over by the Mayor. At the introduction of conscription, this was Samuel Balmforth. The decision made at this local tribunal could then be appealed against at the Recruiting Tribunal covering the south of the West Riding of Yorkshire. This Recruiting Tribunal was often chaired by the Earl of Wharncliffe, and his absence by William Wright Warde-Aldam, the head of Frickley and Hooton Pagnell Hall. There were also specific tribunals for the Rural District and for local collieries. The Quakers were a prominent group in the anti-conscription movement. The Doncaster Gazette reported in February 1916 that at the Annual meeting of the Society of Friends (Quakers), Oswald Clark, a prominent local Quaker stated compulsory service was ‘ruthless’ and ‘indiscriminate.’ When the Doncaster Chronicle reported on Oswald’s tribunal hearing in April 1916, the article was headlined ‘The Doncaster “Do-Nothings”‘. At a later tribunal, other members of the Society of Friends appeared. They stated ‘Disband our Army, and Navy, and there will be no war.’ One of the Councillors overseeing the tribunal responded with ‘Conscience makes cowards of us all.’ A well-known local conscientious objector, whose case was heard at the tribunal, was John Hubert Brocklesby from Conisbrough. John Hubert, known as Bert, was a Methodist preacher and a teacher.He refused to do any war work on religious and moral grounds. After his appearance at a Doncaster tribunal in February 1916, he was arrested and imprisoned in Richmond Castle. Later in 1916, he and 15 others were sent to France and sentenced to death. His sentence was reduced to 10 years imprisonment and he was later moved back to the UK. The Quakers have made parts of Bert’s diaries available to read online. 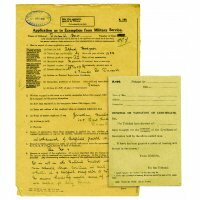 Many conscientious objectors received poor treatment from the military and their community alike. The Doncaster Gazette and Chronicle reported in April 1916 that there was an incident at the Doncaster tribunal during which a member of the committee was heard to call a conscientious objector a ‘coward’ as they exited the tribunal. While he sleeps sound in bed. Many appealed for exemption on the basis of their business responsibilities. One included a hairdresser who claimed he was going twice weekly to military hospitals and shaving and cutting hair of the patients free of charge and should therefore be exempted. His application was rejected. However, a chemist was successful in his application. Also successful was a baker baking ‘Government bread’. His exemption was granted only on the grounds that he remained a bread baker. Many of those seeking exemption on business grounds were granted temporary exemption, only long enough for them to find suitable replacements before they were called up. In many cases, experienced farm workers were considered too important to lose, but in others they were given longer temporary exemptions in order to find older men or women who could work on the farms in their place. Some men, such as Doncaster’s Deputy Town Clerk, Francis Preston were considered too important to lose. Other cases were not work related, but family related. A window cleaner applied on the grounds that he was the sole carer for his mother. Many men applied on the grounds they were last left at home as their brothers were all off serving and they needed to care for elderly and ill family members. Doncaster’s reaction to conscription was mixed. While some welcomed conscription, seeing it as a necessity to win the war, objection to it came from many different angles. Some exemption applications were successful, but many were not. While many shamed conscientious objectors and those seeking exemption, others were more understanding of their beliefs. Even John Hubert Brocklesby’s brother, himself an active soldier, supported his brother’s convictions. Do you have a conscientious objector, a man in a protected occupation or a successful exemption case in your family? Sign up and add your story to our online community archive. Research conducted and collated by Lee Norton, Derek Upex and Leigh Turner, Research Volunteers and Lynsey Slater, Project Researcher.